On Monday morning, between 8 a.m. and 9 a.m. Eastern Time, Hillary Clinton took on a New Hampshire town hall, which aired live on the Today show. In the hours before the town hall, spurred by the Umpqua Community College shooting last Thursday, Clinton unveiled some serious gun reform proposals, like finally closing that gun show loophole that no amount of bipartisan sparring has been able to fix. Clinton discussed the necessity of gun reform sooner rather than later, but also offered a few tidbits that elicited laughter from the audience — like her favorite alcoholic drink, her potential inauguration song, and why she knows Donald Trump won't get her down. The Today appearance comes on the heels of her Saturday Night Live cameo, in which she roundly mocked her flip-flopping on gay marriage and staying mum on the Keystone XL, portraying a wise bartender named Val who counseled Kate McKinnon's Hillary Clinton. 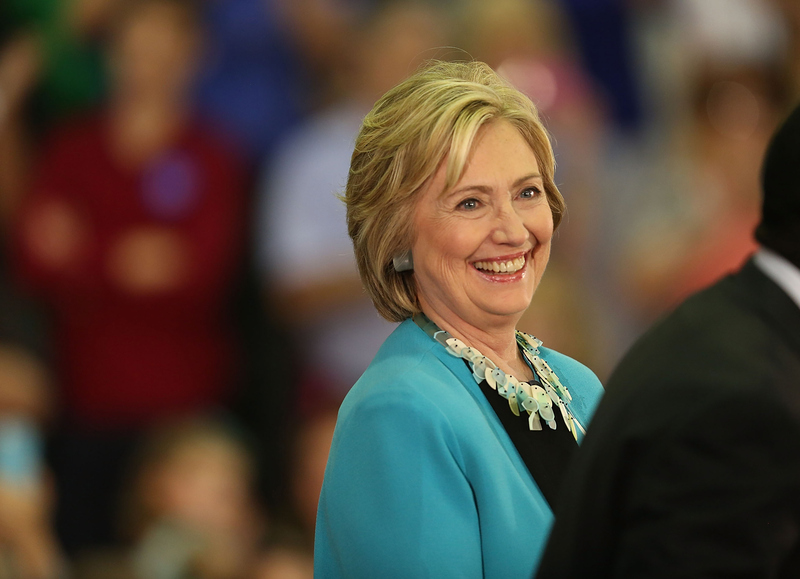 On Monday, as she did Saturday, Clinton didn't veer away from humor. Arguably, her best moment — one that resonated with the crowds that had come to see her — was when she was asked if she was ready to be insulted by Trump (because anybody who's anybody has been insulted by Trump). "As you might have noticed," Clinton said wryly, "I'm kind of used to being insulted." The comment is obvious, but it speaks volumes. Clinton, often attacked by opponents on the right for not showing enough likability — a gendered critique in of itself — has spent decades holding some sort of political role, years in the White House, and has been called out for everything from her looks to her age to her simply being a woman. Now that Clinton is deliberately and publicly letting her guard down as a means of showing spontaneity, she's making no bones about the fact that she's undergone more aggressive criticism that any female politician in recent memory. It's 2015, and already this election cycle, Donald Trump has retweeted the comment "if Hillary Clinton can't satisfy her husband, what makes her think she can satisfy America?" So yes, Clinton is used to being insulted. But furthermore, she's learned how to handle insults — to shrug off the critiques that don't matter (aka all of the above), and to internalize and reasonably respond to the ones that do. In her town hall, for example, she touched on Benghazi, an administration-wide failure that has since become a major talking point for both Clinton and Obama's administration. "I and nobody did anything wrong," she said, echoing what investigations have found, "but there were changes we could make." Other things we learned about Clinton from her town hall: Her favorite drink is "a martini. A vodka martini, in the James Bond way." If she played a song at her inauguration, it would be "Lean On Me." And her vote on the Iraq War? "I misjudged."